Christmas and New Year may be behind us but January need not be a quiet month, in fact quite the opposite. If you are in West Sussex on Friday 25th January 2013 enjoy an evening celebrating the life and poetry of the Scottish poet Robert Burns at Highdown Vineyard. The evening starts at 7.30pm and finishes around midnight (approximately). It promises to be a fantastic occasion, not to be missed! Highdown Vineyard will be hosting, for the third year running, a traditional Burns Night. You can expect an array of Scottish delights including; a piper to welcome you as you arrive (in full Scottish regalia of course), poems and songs by Robert Burns and formal traditions such as a toast to the lassies and a reply from the lassies. These speeches promise to be amusing and shed light on women today. The Scottish food and drinks themed menu will definitely delight your taste buds with a number of mouth-watering courses. The tasting of Scottish Whiskies is definitely set to be one of the highlights of the evening. Remember high-quality whisky (or any whisky) should be served in the appropriate glassware. It goes without saying (but we will say it anyway) that whisky is best served in a Glencairn Whisky Glass. This glass is internationally known and appreciated as the official glass for whisky. It is used notoriously by master blenders and connoisseurs all over the world and is highly praised. The glass’ unique shape enhances the enjoyment of single malts and aged blends alike, while the solid sturdy base allows for a comfortable grip so you can fully appreciate the whisky’s colour and aromas. The Glencairn Whisky Glass received The Queen’s Award for Innovation in 2006. 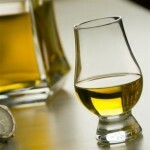 We offer a high-quality glass hire service for this whisky glass as well as wine tasting glasses. 1. Colour – is your whisky light gold or rich amber? The colour of whisky can indicate the type of oak cask used along with the length of maturation. Use this whisky colour chart (produced by Whisky Magazine) to help with your whisky colour identification. 2. Body – taste your whisky and review whether it has a light, medium or full body. You can also describe the mouth-feel of whisky as thin and light or thick and full. 3. Nose – ‘nose’ your whisky and jot down the different aromas, for example the whisky could be malty, fruit, smoky or chocolaty. We recommend swirling the whisky in the glass carefully and taking short smells of the contents. 4. Palate – what characteristics do you notice on the palate, is the whisky delightfully sweet, rich and fruity, meaty, or peppery and hot? 5. Finish – this is the length of time the flavour remains on the palate. Do the flavours linger for a long time or disappear rather quickly? The best whiskies will have a long and enjoyable finish. Look out for these (or rather taste)! Quick fire fact #1 It is rumoured that the Jack Daniel’s company (in Tennessee) give a free bottle to every employee on the first Friday of every month. Hire us please? Quick fire fact #2 36 bottles of whisky are shipped from Scotland every second. If you would like further information regarding the Burns Night please see Highdown Vineyard’s website, tickets are priced at £34.50 each and you must call to book a place. If you have any questions regarding products featured in this blog or those featured on our website then please contact us today via our online form or speak directly to us on 01903 786148. We will do our utmost to answer all of your questions. Or perhaps you simply have a whisky fact to amaze us with. Note: If you are a wine company, club or merchant with a whisky tasting event in 2013 let us know. We would love to add you to our 2013 UK Whisky Tasting Events Calendar and even review the event. The more the merrier!